So, we got the news and we're totally AMPED. 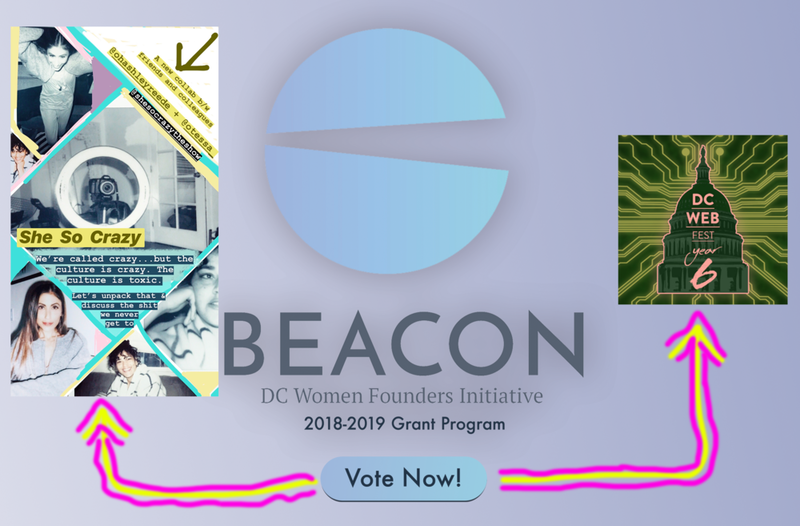 Two of Otessa's projects have been selected as apart of the Beacon Grant Program community voting round! Pretty exciting to say the least. In short, the Beacon Grant Program provides funding and resources to women who are doing major work and making an impact in the DC area. The idea is to make DC a hub for female entrepreneurs- stuff created BY WOMEN, FOR WOMEN. The two projects selected are DC Web Fest and "She So Crazy". 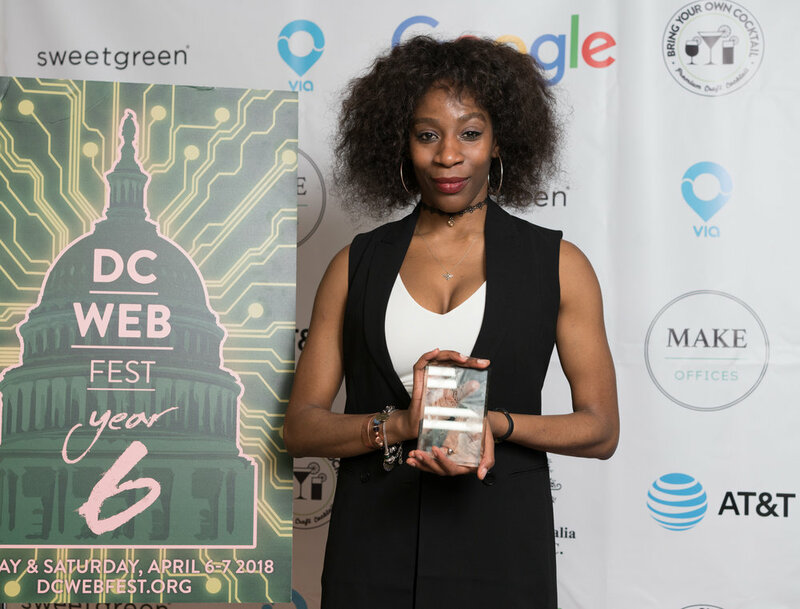 Most of you probably already know all about DC Web Fest, the area's first digital media festival that entertains and educates through promoting and showcasing the best of indie digital content. "She So Crazy" is the newest project co-produced by Otessa Ghadar and good friend Ashley Reede. "She So Crazy" is a multimedia project that uses portrait photography, podcast segments, blogs, and tv/digital series to give women a platform to tell their stories and experiences with toxic culture- from microaggressions and sexism to internalization and coping, we are unpacking it ALL with this project. The hope from the project is that women will not only experience a sense of relief and liberation upon speaking out on these issues, but we hope that it will form a sort of sisterhood. If we win this grant, we will be provided with the funds and resources to scale up the QUALITY and QUANTITY of our content, reaching a wider audience and making a greater impact. Are you with us? If so, do these two steps to push us closer to winning! 3) Search for DC Web Fest and She So Crazy and vote! We're reaching for the stars! Est. 2013...Our baby is growing up! Its official, we're back it again, seeking a home for DC Web Fest 7! It was nice having a few months off from planning, but it's pretty exciting to get back into the groove of it all! Ayyyy our baby (DC Web Fest) is growing up so fast, what is a parent to do?!? It all happened so suddenly. Otessa Ghadar conceived the idea upon realizing the area's urgent need for a platform to showcase and promote the best of indie digital content. 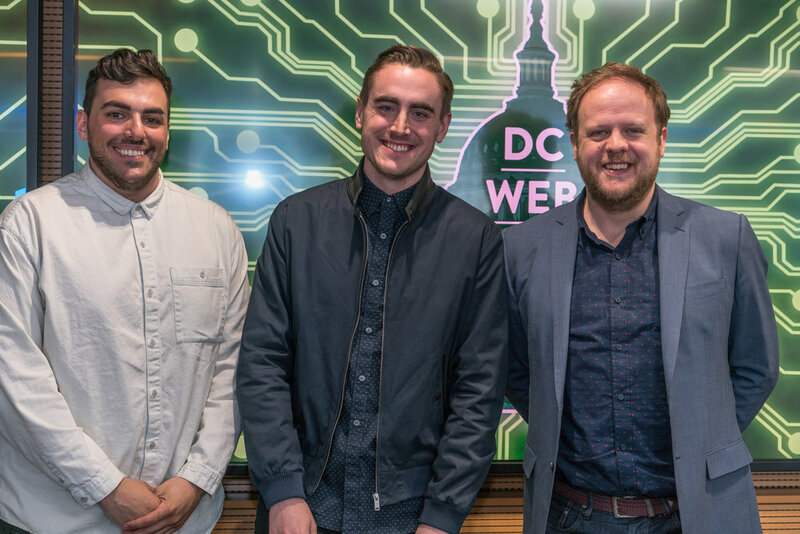 Upon carrying the new baby and enduring some labor pains that accompany the launch of a new venture, DC WEB FEST WAS BORN! Perfectly healthy, bringing joy, entertainment, and inspiration through digital content to people all around the world. Nothing makes a parent prouder than to see their baby making a difference, right?!? To celebrate DC Web Fest's 7th birthday, we need to pick the PERFECT venue at the PERFECT location so our guests can have a PROFOUND experience. Much research to do, many places to consider. Stay tuned as the planning for DC Web Fest, Edition 7 unfolds! DC Web Fest EDITION 7! Cam Willams (left) & Romeo Carbarga (right) of the DC Web Fest Team. Here we are, August 1st. It is so amazing how time FLIES. 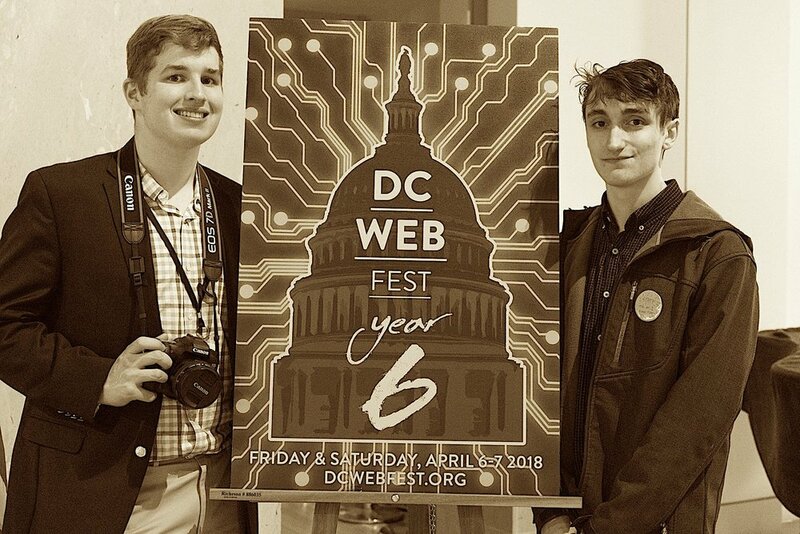 It seems like just yesterday the DC Web Fest team was in the development stage for DC Web Fest 6. This exact time last year, the team was researching and location scouting to find a home for DC Web Fest 6. Then came the web development part, the sponsorship hunt, recruiting top-notch industry professionals to serve on the advisory board, etc. to build up to the amazing experience we all had on April 6 & 7. Its crazy that we're about to jump back into it all over again :) Exciting it is. How can we scale up this year? How can we provide our attendees with a remarkable experience that they'll never forget? How can we scale up our content? WHERE IS THE HOME FOR DC WEB FEST EDITION 7?? All things we have to consider and figure out over the next several months. Nonetheless, one thing we are sure about is we're SCALING IT UP and doing it BIG! Stay tuned folks! Unleash Your Creativity and Go Make Something DOPE! So, this blog comes from the heart. It's something that we can all relate to in some way. Creativity is such a POWERFUL tool to provoke thought to stimulate conversation, entertain, evoke social change, etc. The sky is the limit when it comes to creativity. I think it's pretty fair to say that many creatives experience what may feel like is a dry spell- the feeling that your creativity is locked up and your productivity and fruitfulness is minimal. This can be for many reasons. I think one of the most common reasons is the inner-voice or the "inner-me" that can often be our biggest enemy. You know, the little voice that discourages you from pursuing that awesome idea for whatever reasons. The negative voice that tries to gripe you with fear. The self-destructing, critical voice that tells you YOUR IDEAS ARE NEVER GOOD ENOUGH! Guess what, YOU ARE NOT ALONE! Lots of us are dealing with very similar struggles. So, how do you beat it? DO IT ANY WAY! Got an idea that seems crazy or impossible? GO FOR IT! Afraid of persecution? DO IT ANY WAY! Don't think it'll work? MAKE IT WORK! Don't feel like anyone will pay attention to your work and hear your voice? MAKE SUCH A BANG THAT NO ONE WILL BE ABLE TO IGNORE! You gotta just do it, you know? You've got it in you. It's inborn. It's apart of who you are and no one can take it away, not even you! So silence whatever negative voice that has had your creativity locked up and unleash! Go crazy (in a good way!) and make something the world will never forget. Eighth Grade Press Screening- Thanks to The Wing! The Wing DC, a co-working space for women who demonstrate excellence in their work, graciously invited their members to an exclusive screening of "Eight Grade" at E St. Cinema. Many thanks to the Wing for the awesome opportunity to screen this brilliant film! Also, may thanks to our friends Orla Conway and her beautiful mother, Peggy Pridemore (the locations guru for all movies that are shot in the mid-atlantic), who attended the screening on our behalf. "Really fun, the panel afterwards was cool. It's definitely another white teen coming of age story but this one was VERY believable. The awkwardness was played so well that it had the audience verbally cringing and calling out with exclamations of advice lol." "I think we've ALL felt similarly to the protagonist when we were 13." "They cover school shooting preparation drills and sexual assault in a very relatable way that most young women experience." "Yeah Bo Burnam is a YouTube comedian I really like and he wrote and directed the film, so I knew it'd have some poignant moments." I think that's all you need to know to GET OUT AND GO SEE THE MOVIE TOMORROW! Visit https://tickets.eighthgrade.movie/ for showtimes and tickets. Meanwhile, enjoy the below photos from the screening at E St. Cinema (click the photo to scroll to the next). So, it's been about a week and a half since DC Web Fest 6 and the momentum is still WAY up there! Today we would like to give an extra shout out to all of our international phenoms who stand as excellent creative ambassadors for their countries. To our winning creators from all around the world, we URGE you to keep up the good work! Keep creating, keep changing, and keep inspiring. You have every reason to be proud. Also, we definitely want to shout out our official selection and winning alums from American University and Kenyon College. These universities are certainly turning out some amazing creators who are making their mark in this world. We're proud of you and we're sure your schools are as well! These are all folks you absolutely want to keep up with, so follow them all on their social accounts to check out their future projects! In addition to taking home top honors, this year's DC Web Fest Winners will be receiving some pretty epic perks thanks to our amazing sponsors and partners. Web Series winners will be automatically entered into the top rankings for the Web Series World Cup. The WSWC is partnered with Cannes Series and MIPTV tracking winners in over 17 of our partner web series culminating in an overall winner. Winners of our Blog and Screenwriting Categories will receive the world's best selling scriptwriting software, Final Draft. For our Podcast Category, Podcast Village is offering two hours of studio time or equivalent mentoring consultation at their state of their art location in Georgetown. And finally, for all our LOCAL HERO Winners, our fantastic sponsors at Make Offices Glover Park are offering 6 MONTHS of free creative coworking space at their Glover Park location! 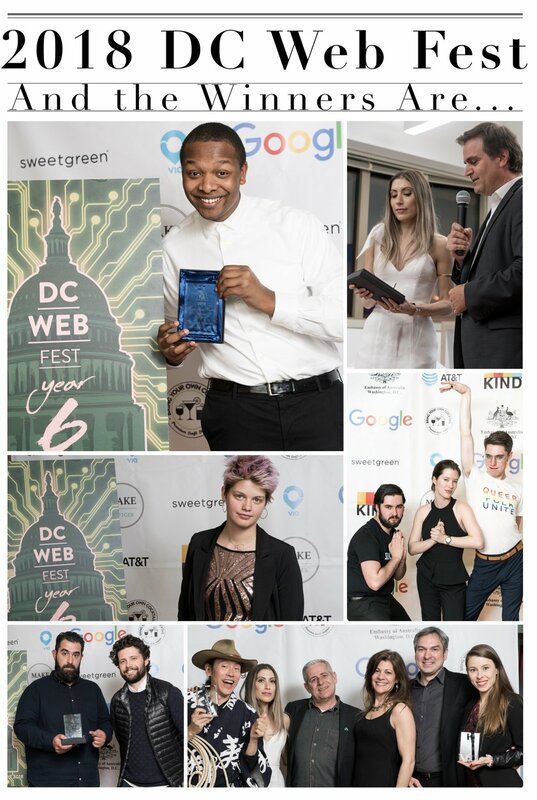 Thanks so much to all our sponsors and partners and congratulations to our official 2018 DC Web Fest Selection and Winners. DC Web Fest Day 1 & 2 Info! Malika Saada Saar, our keynote speaker, will be delivering her address at 1 pm. Do not miss one of the most important humanitarian lawyers of our age. 6pm-9pm events at Embassy of Australia, Washington, D.C (1601 Massachusetts Ave NW, Washington, DC 20036). Please arrive at the embassy no later than 5:45pm as screenings will start promptly at 6pm and Embassy Security will not let you in! 6pm-10pm events at MakeOffice at Glover Park (2201 Wisconsin Ave Suite #200, Washington, DC 20007) A Conversation with FCC Commissioner Clyburn will start no later than 6:10 - do not be late for your net neutrality advocate! 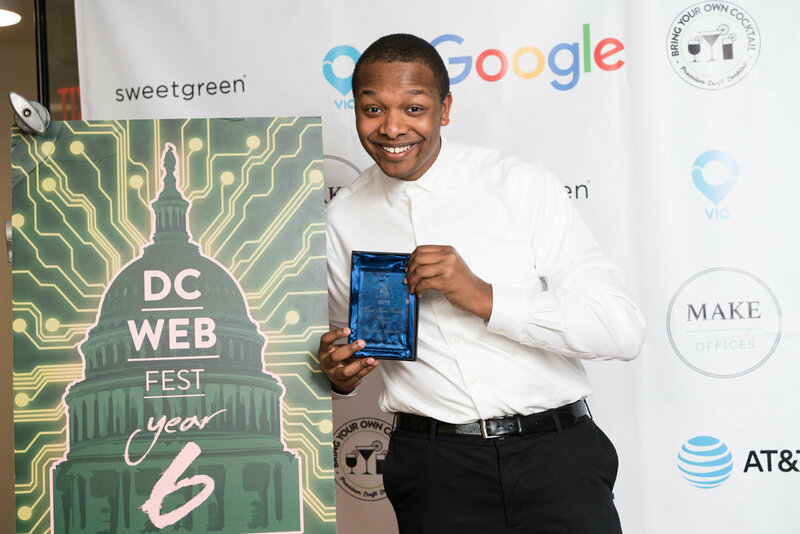 DC Web Fest 2018: Official Web Series Selections! Congratulations to our official web series selections! Wow. You all made this year a tough one. We got incredible content from all over the world, we send a hearty congratulations to everyone who participated - keep it up! This year, we are segmenting our selections into American series and international series. Take a look at their loglines below! Other People's Children: Margot Antler dreams of becoming a renown novelist with a three-book deal and a summer house in Ghent. Reality check: she's a rookie second-grade teacher about to experience the insanity of parent/teacher conferences for the first time! In each episode, Ms. Antler finds herself across the table from adults behaving like children, and slowly comes to realize it's not her students who have problems, it's their parents. #WhoKilledHeather: #WhoKilledHeather is a 36 episode murder/mystery web series following college student Andrew Olson on his personal investigation to uncover the truth behind the recent murder of a classmate. Kill Me: "Kill Me" is a comedy series about actors who specialize in playing dead bodies on TV procedurals. | Bernie Wentworth’s passion is playing dead bodies on TV, or as she calls it: corpse acting. Whether it’s crime procedurals or character-driven dramas, Bernie is always enthusiastic about lying down, silent, and motionless. Corpse acting mostly consists of morgue work and crime scenes, but Bernie’s dream role is to be an omniscient dead narrator. Like Desperate Housewives or Gossip Girl, but dead. Saaba: Made by DC native Lance Kramer, SAABA is a six-part documentary series that traces the personal stories of residents and police fighting insecurity on the region's frontlines. The recent killing of four U.S. Army Special Forces soldiers in Niger and an attack in the summer of 2016 that claimed the lives of 18 people in Burkina Faso highlight the extremist violence and other security threats facing communities in the Sahel region of Africa. From the award-winning filmmakers at Meridian Hill Pictures (CITY OF TREES) and Big Mouth Productions (CAMERAPERSON), Saaba chronicles a USIP initiative to build trust and reduce tensions among citizens, police, local authorities and informal security groups outside Ouagadougou, the capital of the West African country of Burkina Faso. Beast: After his father mysteriously goes missing at sea, a teenager rallies the help of his small fishing-island town to set out and find him. Photographers Without Borders: PWB (Photographers Without Borders) TV takes our viewers all over the world to explore the challenges we face on the planet and the people who are taking them on, all through the lenses of our heroic photographers. This season takes us to Kenya to look at human trafficking, to India to look at how women are affected by the caste system, to Bali to learn about sustainability and poverty reduction, and Bosnia and Herzegovina to learn more about how youth see the world post-conflict. PWB strives to address the UN Sustainable Development Goals through storytelling and PWB TV is one of our main vehicles. She's Got Grit: She’s Got Grit is a docu-series about female athletes with disabilities who compete at the highest levels, in an attempt to change the perception of disability in our culture. DOOMSDAY: This dramatic series follows the daily lives of the dozen millennial commune residents in The Catskills. Dagny, the enigmatic leader of the sect, leads daily group unity exercises, enforces 'green initiatives' (ie: one bath a week, raw food diet and biodegradable uniforms) and preaches of the dangers of over-population (which rapes the precious earth of nutrients.) Abstinence within the sect is obviously mandatory. When Dagny has a prophecy about the end of the world, chaos ensues. The Pepper Project: Ex-CIA super-sniper Pepper and her boys Friday must solve a series of increasingly dangerous puzzles in order to find her missing sister. We tell a story of personal challenge with intriguing and complex characters, plotlines that intersect and unravel, sans gratuitous violence. People Who Brunch: Sunday brunch has become a staple for the upwardly mobile millennial. This series satirizes the high maintenance crowd and the requests one might overhear while enjoying a Sunday brunch. KYNNSTLAH: KYNNSTLAH is a mini-doc series that discovers and portrays emerging artists and explores art as a means of expression, communication, and emotional connection. Mona Lisa Cowboy: Living abroad can be a curse or a blessing. Playfully reflecting on misunderstandings, surprise encounters and the vagaries of an expat life, MONA LISA COWBOY (a dramatic comedy about two estranged Chinese twins brought together by a Japanese-American cowboy in Paris) tells the universal story of wanderers, living between comedy and drama as they straddle cultures. This is Desmondo Ray (Australia): Internationally acclaimed that combines live action with animation, this unique series follows a peculiar man's search for love in a dark and troubling world. Alice in Paris (France): A short-form, scripted series where we follow an energetic young woman through the streets of Paris to find the best food and places in a city she knows like the back of her hand, but one in which she can still easily get lost. We All Wanted to Kill The President (Spain): A group of catering workers receive an unexpected visit: the arrival of the president of the government. A corrupt guy, known for his excesses and hated by much of the population. They will start joking with poisoning the food, of course, all in jest. Until, the next morning, Martinez de Ochoa is found dead in a hotel room in a mysterious way. Restoration (Australia): In a near-future world, where individuals have their memories downloaded for backup, a man awakes in a body that is not his own. Supa Supa (France): Supa Supa, the story of the unusual superhero guy who goes on a quest full of hope, energy, and first-world hardship before he can call himself a man. As he finds himself struck by The Perfect Girl’s beauty, he discovers his power: to bend and control reality thanks to pixilation. However, this amazing ability won’t necessarily make his hardships any easier. Will he romance The Girl of his dreams? Spectrums (Israel): Spectrums is a new Israeli documentary series that follows the social, political and spiritual world of 10 members of the transgender community in Israel. PSUSY (New Zealand): PSUSY follows two grotty girls as they suss out their offline lives as low functioning “adults”. On the backdrop of sexploits and getting high we follow their peaks and troughs dealing with various societal woes - albeit with splotches of the absurd. How to Buy A Baby (Canada): Thirty-something couple, JANE and CHARLIE LEVY, have long given up on having a baby the fun way. Having been diagnosed with infertility, they are resigned to needing costly and invasive assistance if they are ever to become parents. They are determined, though, to keep things fertiliFUN and not lose sight of the reasons why they wanted to have a baby together in the first place. Dragon Race (France): Six people kidnapped by a Korean billionaire are forced to take part in a new kind of car race. Using VR simulators at first, they soon enough engage in a real race with no holds barred. Until death. Anachronism (Italy): Walter hasn't left home for over 7 years: he's tormented by his past and poetry is the only comfort he has. One day he hears a woman singing on the other side of his apartment's wall. This new potential friendship could be his chance to open up and easing his burden. Nemausus (France): Ben just turned 30. He's a shy man, and in love with his coworker Diane. He's got two main passions in life: Historical reconstitutions with his figurines club, and his job at the Tourism Office in Nîmes, which consists in taking visitors on board across the city. One sad birthday party, time-traveling mystery folk, and a Roman named Volesus turn Ben's world upside down. Avalon Now (Australia): At the heart of Sydney’s northern beaches lies the sunny suburb of Avalon, where attractive, socially-progressive families cruise through life in four-wheel drives. But beneath the sunny veneer the suburb is gripped by crisis, mostly of the mid-life variety. Prosecco or Champagne? How does this Tinder thing work? And what if the year’s biggest social event – The White Party – is a flop? This series shows you the underbelly of Australia’s most glamorous postcode.